The global market for environmental consulting (EC) services jumped 6.2 percent in value during 2017 to reach $34.1 billion, according to the latest research report published by Environment Analyst. This is almost double the growth in 2016 and by far its best performance in all the years EA has tracked and reported on the global market movements annually since the start of the decade. Signs are that 2018 will see a similar order increase. Growth among the top players has been aided by recovering mining and commodities markets (although the oil price trend has yet to inspire a sustained recovery in that important area for environmental consultants) as well as strong demand in climate resilience and storm recovery work in the key North American market. Also contributing to the result was a return to more buoyant conditions in Asia-Pacific spurred by several factors including China’s tightening environmental standards and enforcement. However, it is also notable that among the cohort of the leading international EC players analyzed in depth in the study (the Global 22), growth is being spearheaded by those in the lower half of the rankings rather than those in the top tier. This year’s findings once again suggest that the mid-size multidisciplinary firms and smaller environmental/sustainability specialists are more often than not outperforming their larger fully integrated technical and professional service provider rivals, for whom EC activities typically represent 5-10 percent (or even less) of overall group revenues. Although the picture as a whole is now undoubtedly improving, the peer group has been through an extended period of low growth and consolidation over the last five years, with many of these firms actively participating in mergers & acquisitions to boost growth – some on a truly transformational basis. The Global 22’s dominance of what is still a fragmented market is evident from their combined performance in 2017, which saw aggregated EC revenues increase by 6.4 percent year-on-year to account for 43.6 percent share of the total global sector. 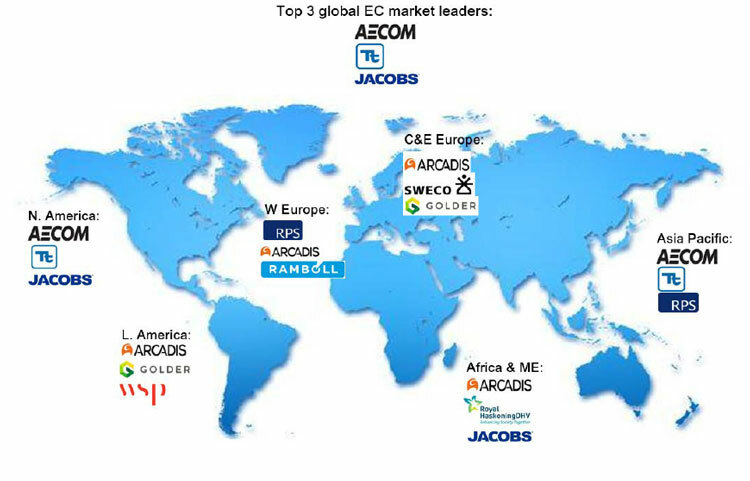 Yet despite the continued consolidation, only three players — AECOM, Tetra Tech and Jacobs — hold an individual market share in excess of 5 percent. Former number-two CH2M has disappeared from the top three and wider rankings thanks to its takeover and rapid integration during the last year by Jacobs, a move which enabled the latter to rise up the table from its previous position of 16th to grasp the number three spot. Meanwhile, Arcadis and ERM complete the top five. Mega-merger activity also saw the entry lower down the table of SNC-Lavalin to the Global 22, thanks to its acquisition of Atkins in 2017, which sees their combined global EC operations now ranked 19th. The report provides critical insight and analysis on the key strategic priorities amongst the top flight players as many have sought to rebalance their organic growth vs. M&A activities of late, and prioritize their most profitable activities in response to the changing market dynamics and disruptors. It looks at how firms are addressing market cyclicality, the impact of the trend towards larger contracts and the resourcing challenges as the upturn gains momentum in different sectors/geographies, as well as how players are embracing the digital revolution. Geographically, approaching a half of all global EC revenues in 2017 were focused on the North American region (45.6 percent), with West Europe taking just under a quarter (22.7 percent). Asia-Pacific now ranks a close third thanks to its double-digit growth (21.7 percent), whilst Africa & Middle East (4.4 percent), Latin America (4.0 percent) and Central & East Europe (1.5 percent) account for the remainder. The top three EC players in each region are shown on the map below. Deputy Editor of Environment Analyst’s Global Market Intelligence Service and co-author of the report, Anya Hembrough, comments: “Despite the lingering conditions in the oil & gas sector, recovery in other sectors and regions suggests that the global EC market is now undeniably back on a growth trajectory following a very difficult period post-GFC and then as the commodities super-cycle fell away. Growth in the region of 5-7 percent in 2017 and 2018 is welcome proof that the industry is successfully repositioning itself to a new market norm with so many different drivers and disruptors at play compared to just five years ago. Growth is forecast for 2018 and 2019 albeit at a slightly lower level given the political and economic uncertainties expected to impact key regions (notably relating to the US and Brexit in the UK/Europe) curbing confidence. But over the longer term, the compound annual growth rate from 2018 to 2022 is lifted in EA’s latest global forecast model — compared to last year’s (EA Jan. 11, 18) — at 4 percent. This would bring the worldwide EC revenues to $41.5 billion by the end of this five-year period, with Asia-Pacific (driven in no small part by China) expected to account for around one-third of the c$7.5 billion new market space created. The Global 22 together employ approximately 82,000 EC staff (FTEs) worldwide, servicing around 220,000 EC contracts per year, with an average contract value of $77,000. Based on the key performance statistics reported to — and analyzed by — Environment Analyst for the Global 22, EC services areas which saw the biggest (double-digit) increases in 2017 were: water & waste management (+22.3 percent), environmental management, compliance & due diligence (+15.2 percent) and climate change & energy (+13.1 percent). In contrast work related to contaminated land and EIA & sustainable development were in decline, with growth at -6.2 percent and -5.1 percent respectively.